Take a sparkly stroll at the desert-based destination. Take a sparkly stroll at the desert-based destination beginning on Wednesday, Nov. 23. THE DESERT IS ALIVE... with scurrying lizards and cooing birds and howling coyotes and any number of furry, scaly, feathery denizens, but the time of day a lot goes down is the question mark. Many critters who call warmer landscapes home tend to be more active after sundown, while some trundle along in the heat of the day from shady shrub to shady shrub. Discovering the day/night patterns of desert denizens is a worthwhile course of natural study, but you don't need to wonder what time of day or night that twinkly little bulbs lend a famous desert destination glow, for that's right on the destination's web site. It's The Living Desert we reference here, the Palm Desert animal preserve that's home to a caboodle of arid-awesome beasties, from tortoises to wolves to bighorn sheep to badgers to bobcats. And it is WildLights we also reference, the November-into-December dazzle-tacular that's all about lighting up the typically dark spaces of animal park. WILDLIGHTS... has been around for quite some time now — 2016 will be its 24th go-around — and both regional residents and those from around California call upon it to get a sense of how illumination enhances a space that isn't tree-filled so much as lush with the scrubbier (and always splendid) flora of the desert. Prepare to view "over a million twinkling lights" during the multi-night happening, which opens on Thanksgiving Eve and runs right through to Christmas Eve. Might you even arrive earlier in the day to see the animals, too? 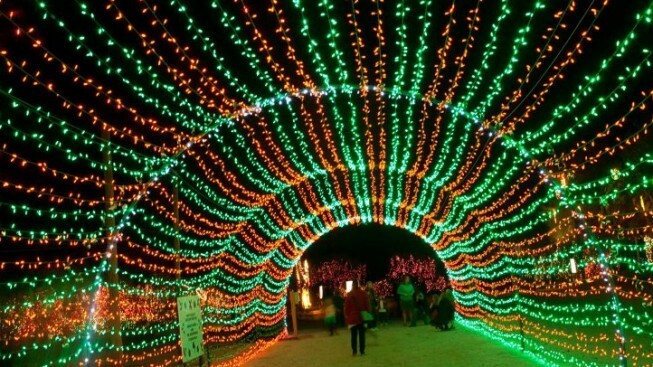 It's a good idea, especially since WildLights is about viewing the seasonal displays (a tunnel of lights, animal lanterns, and such) and not about saying hello to The Living Desert's denizens. Santa, by the by, will be around, too, at the seasonal staple. Consider a twinkle-lovely night spent in a place that typically is mostly lit by the moon, a place where wolves and tortoises and badgers rule the roost.